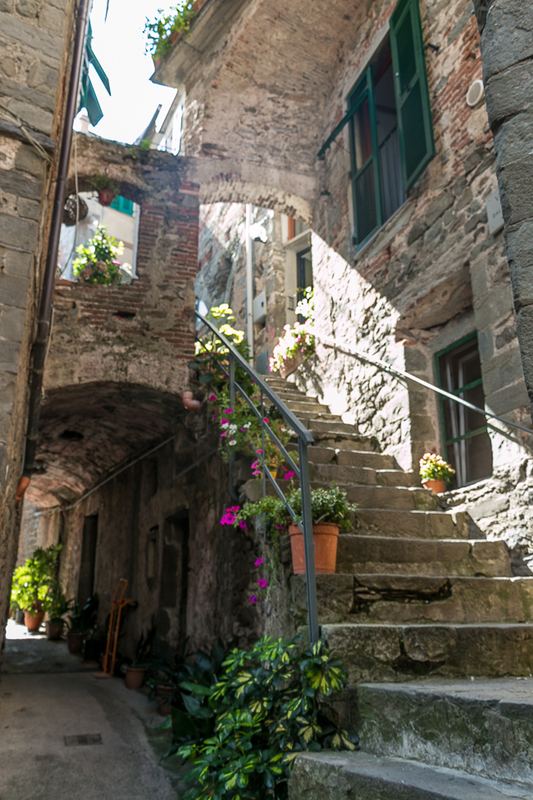 Five beautiful Italian villages along the Ligurian coast – what more could a visitor ask for? 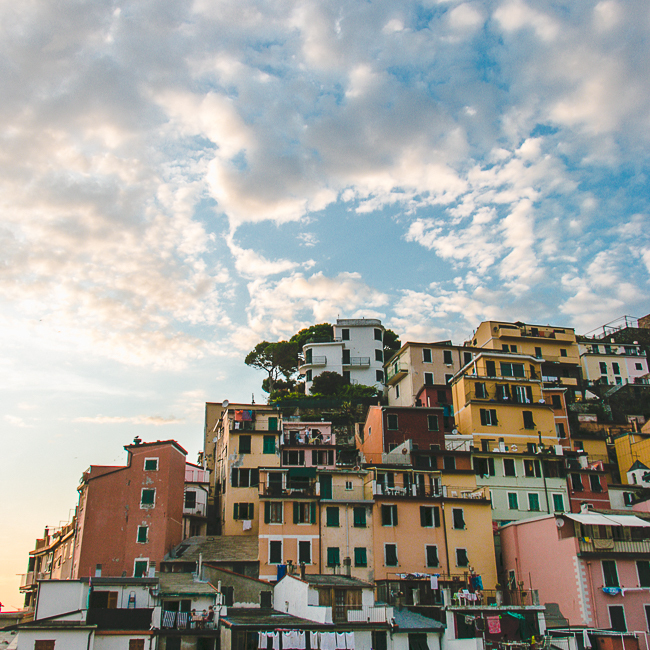 Spectacular sea views, charming narrow streets, amazing cuisine, gorgeous hiking, it’s no wonder that Cinque Terre is high on just about everyone’s bucket list. 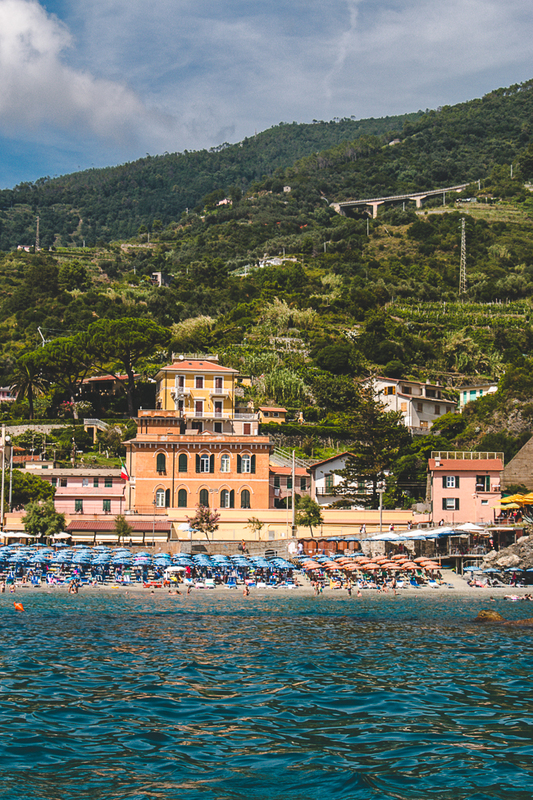 Named to the UNESCO list in 1997, there’s a plethora of options on where to stay and what to do and eat, here’s a quick guide to navigating Cinque Terre. To get your bearings, spot each village on the map. I’ve also flagged Pisa, Milan and Florence so you can see how convenient the villages are to these destinations. We’ll start in the south then move our way north. Note: Every single village is amazingly beautiful and charming, instead of harping on just how pretty each village is, I’ll tell you what makes it unique! 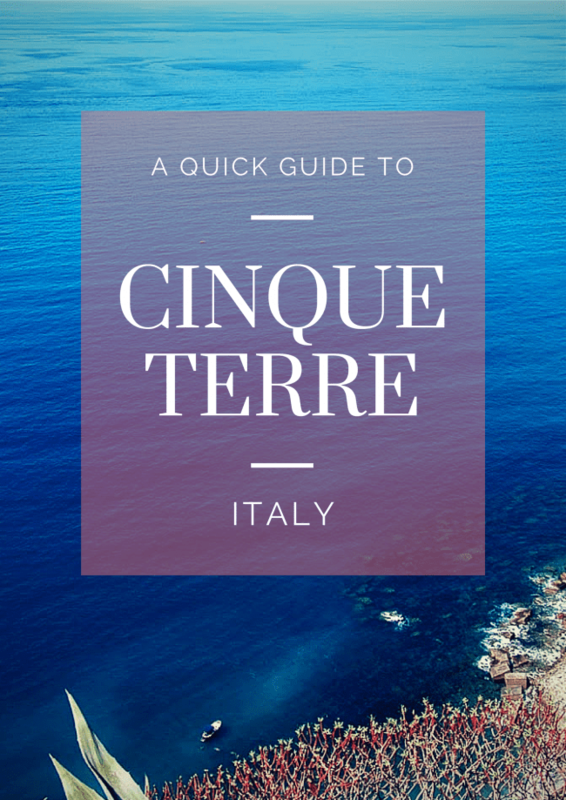 If you’re keen to do the entire Cinque Terre hike, this is a great starting point. 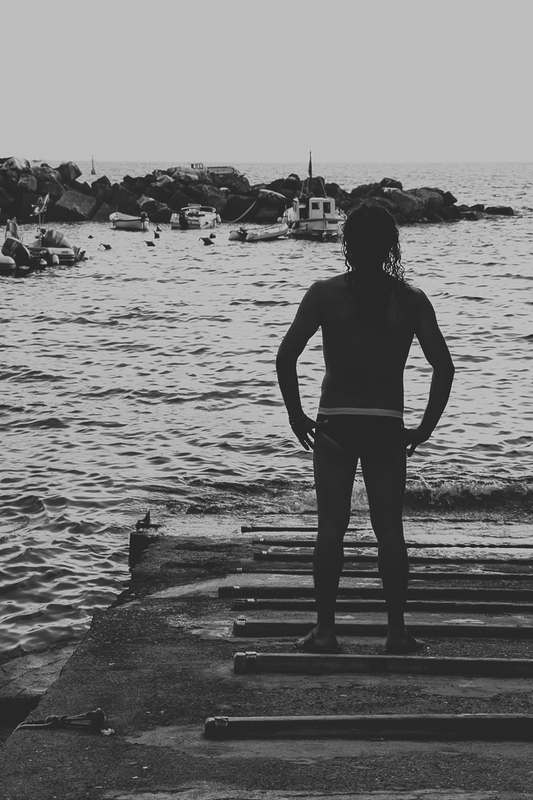 Unlike the rest of the villages, this town has the feel of being most authentic, as the fisherman tug their boats up through the village square. A bit rougher around the edges, this is the largest village and sprawls along the steep hillsides. 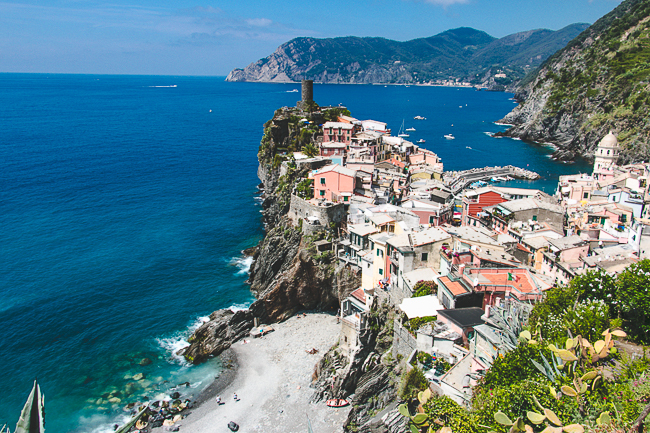 Since it’s at the base of Cinque Terre, it’s also the most accessible. This is the only village without a harbor but that doesn’t mean it’s not worthy of a stop! My sister claimed this village to be her favorite. Floating atop the steep cliffs above the Med, the views are dramatic! 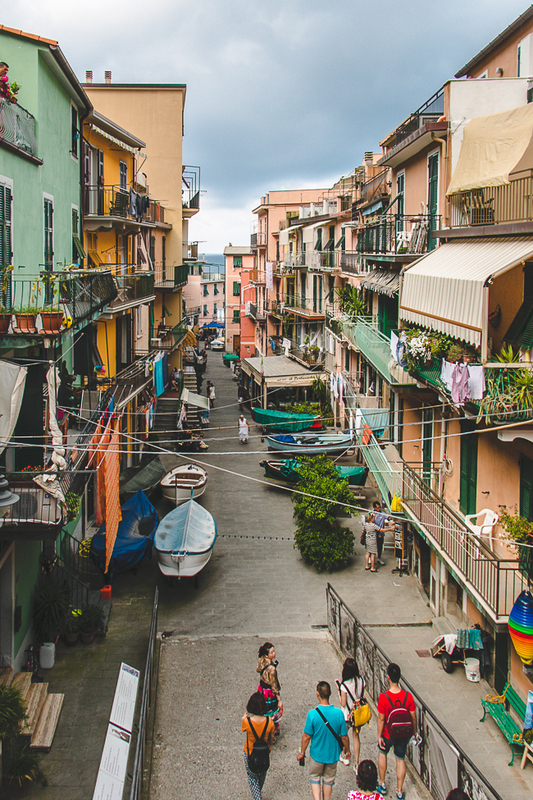 Lacking a harbor and therefore potentially less tourists, the village feels well preserved in some sort dreamy Italian time capsule. 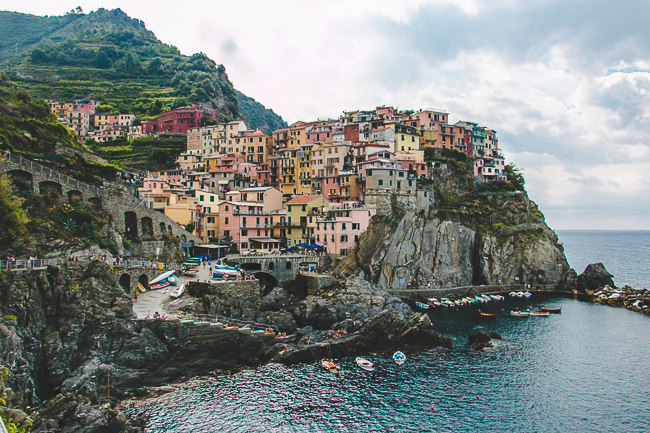 A gorgeous little harbor below and beautiful wine vineyards above, Manarola is my favorite. During a visit be sure to take the wine trail walk along the hillside for spectacular views. A darling street cuts right through the village and winds it’s way down to the cozy harbor. 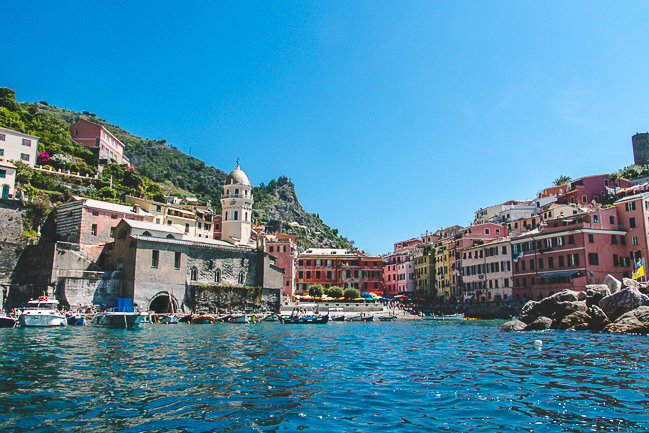 It seems as through most people, especially my man Rick (Steves, that is), adore Vernazza the most. Who can blame them? 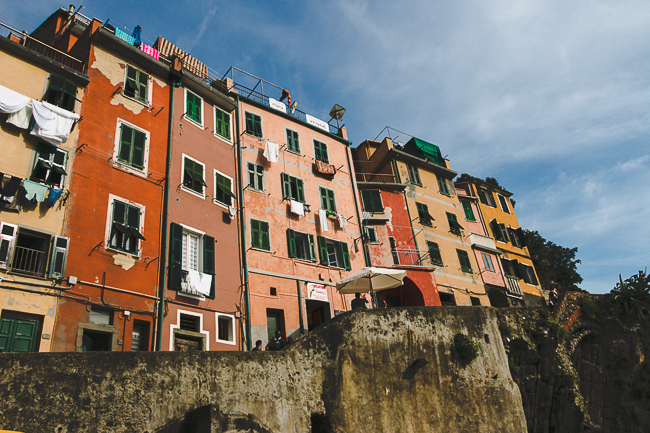 The shot below is on the cover of countless European guidebooks and the face of Cinque Terre. 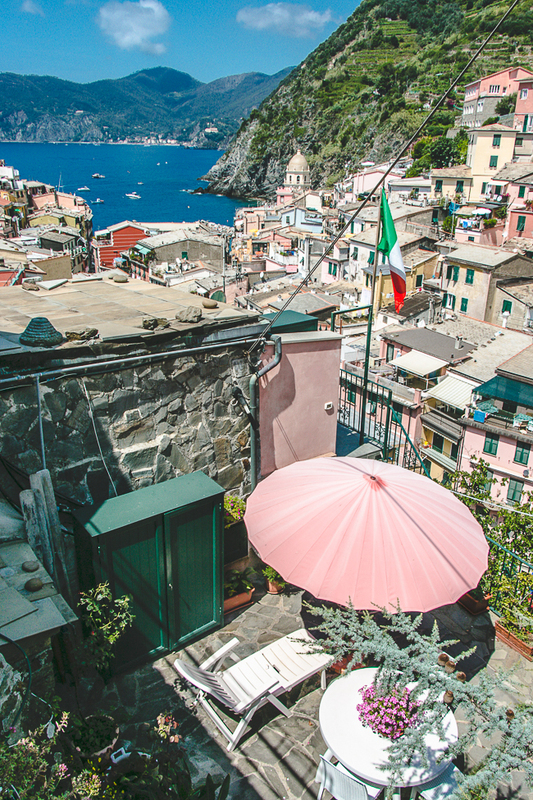 The village of Vernazza juts out to sea flanked by rocky beaches on either side. The wide main street is filled with shops, restaurants and, of course, tourists! 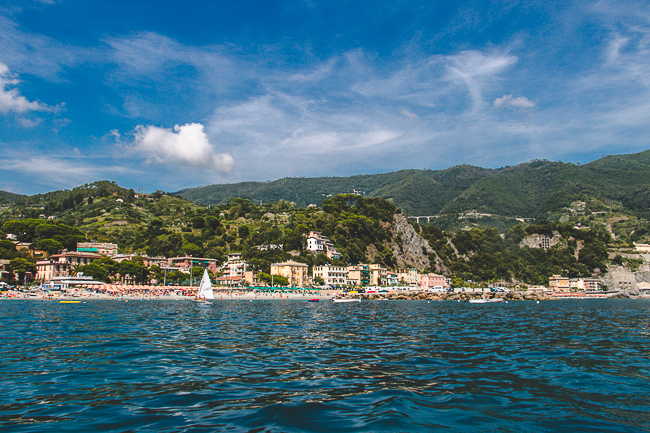 We enjoyed renting a boat from the harbor and investigating the dramatic coastline more closely. 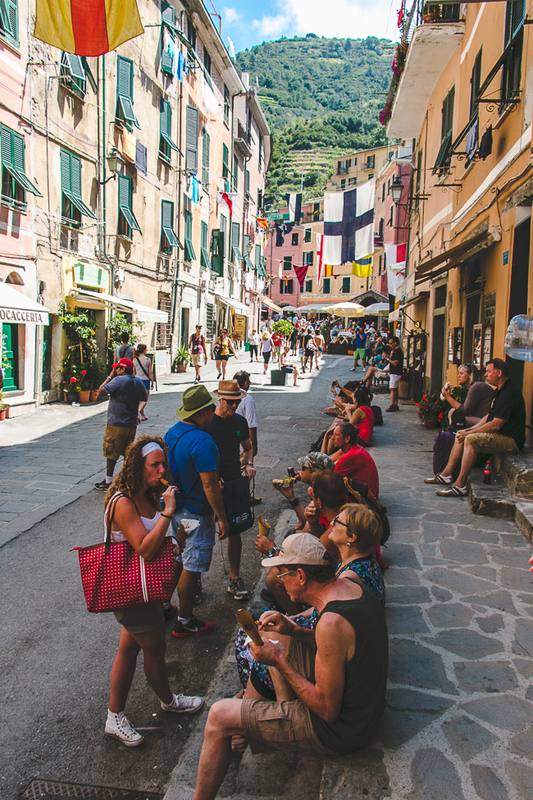 By far the flattest village, Monterosso is known for it’s pebbly beach and more spacious village streets. 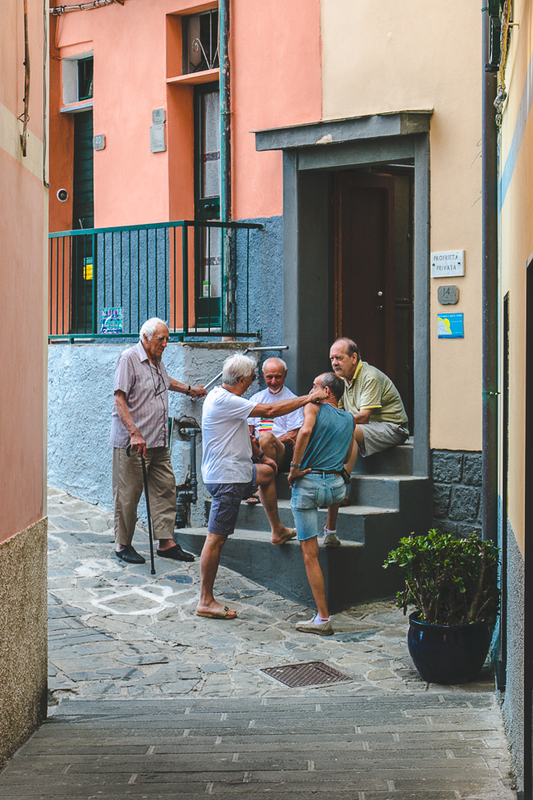 For those that aren’t game for a lot of walking or tight quarters, Monterosso is a great bet. I enjoyed an afternoon of beach-side caprese and suntanning. Being by the sea, you can bet that seafood (like mussels, sardines and octopus) is extra fresh and coupled with Italian seasonings, extra delicious. Also plan on zingy dry white local wine, flat omelettes (similar to frittatas), and amazing focciaco-like bread called farniata. You are in Italy, after all, so also count on classics like limonino, pesto and tagliatelle. 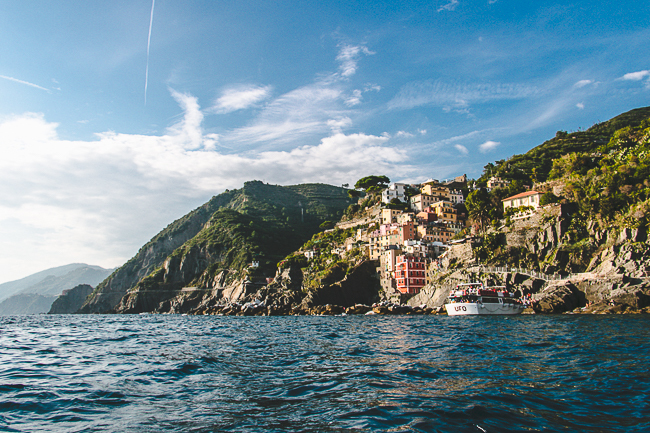 Cinque Terre is famous for it’s stunning seaside hiking trail that connects all the villages. Do not, however, underestimate how difficult this trail is. Even my Denverite sister, who lives for a good climb, found it to be challenging! 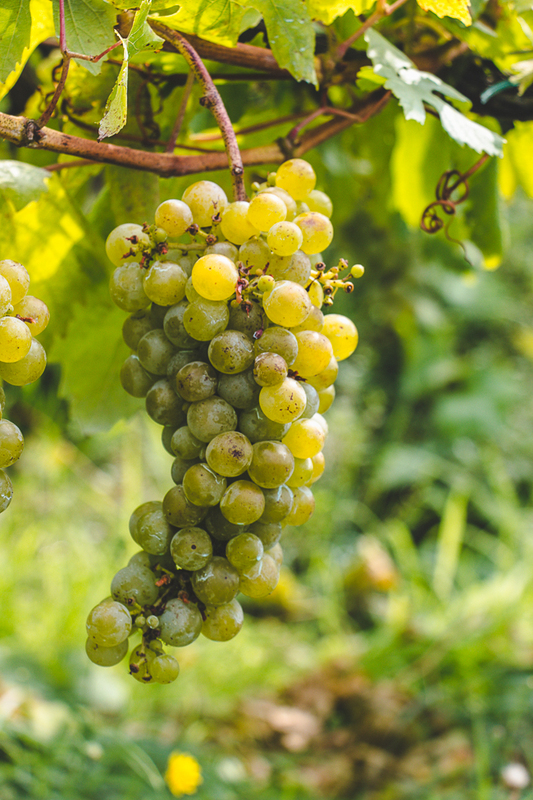 The good news is that after a daylong hike you can treat yourself with a mountain of fresh wine and pasta without the guilt. A train connects all five villages making it by far the most used, reasonable and convenient mode of getting around. Bear in mind that you should still anticipate a solid amount of stairs and walking in order to really get a feel for the sights. Alternatively, ferry boats also connect visitors to each village. Although ferry schedules aren’t as frequent as the train, they are a far more scenic method of getting around. 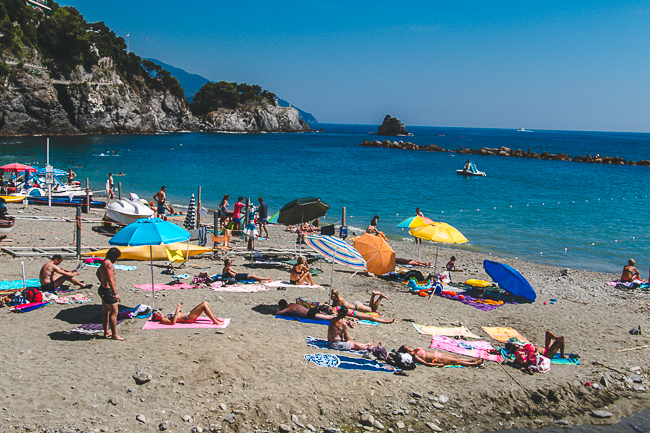 We took the ferry from the top (Monterosso) to bottom (Riomaggiorre), which is how I collected many of the pictures in this post. 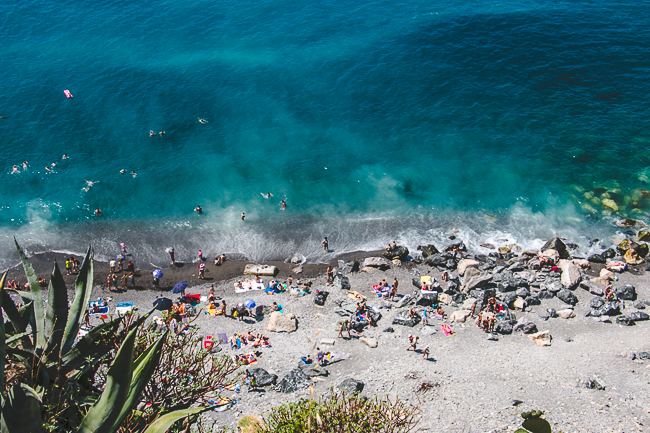 Finally, for the athletic and adventurous, the cliffside hike running up the coast could be a great alternative for backpackers. P.S. 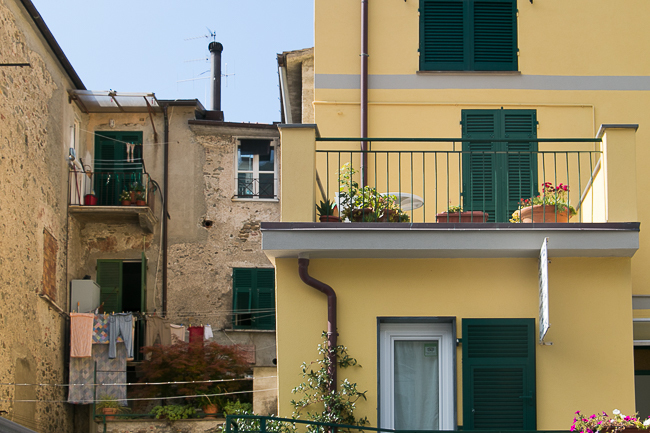 Pair a visit to Cinque Terre with a tour of Pisa and Florence! Get the details about this 1 week itinerary here!